J.M. Guy did not grow up playing basketball, but she certainly grew up in a basketball dominated home. If she could do it all over again, she would give it a try and would have become a superstar point guard. Miracles do happen. Throughout the years, she has become a fan of both basketball and football. She loves to travel and watch sports with her family. A native New Yorker, she currently lives in Georgia with her husband and their four children. Though she has written many short stories and song lyrics, The Dunk’N Divaz: Confessions of a Tween Superheroine is her first published book. Check out J.M. Guy's blog post, "The Story Behind The Story" on her website and find out the inspiration behind this book and the series. Confessions of a Tween Superheroine: The Dunk'N Divaz Series, PlayBook 1 is a superhero fantasy novel for children and preteens written by J.M. Guy. How does a 12-year-old diva with her own jammin’ a capella group get to perform before Diaman Brungdee, the genius promoter behind American Divaz? Granted, she could wait until she was 16, which was the minimum age for tryouts, but Skylie G. just didn’t want to wait that long. Then she found out about a casting call for a reality show that might just fit the bill for The Divaz Five -- especially since Brungdee was going to be one of the judges. Okay, they wanted girls who could really jam a basketball, and The Divaz Five were absolutely clueless when it came to dribbling, layups and the like. But, maybe they’d get a chance to strut their stuff. Now all she had to do was convince the rest of The Divaz Five that they really cared about a basketball competition. J.M. 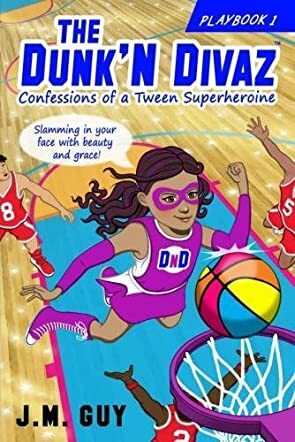 Guy’s Confessions of a Tween Superheroine: The Dunk'N Divaz Series, PlayBook 1 is a fast and fun story about five prodigious tweens whose decision to answer a basketball casting call has life-changing repercussions. I loved this upbeat and empowering tale that will have girls reconsidering their decisions about sports and feeling incapable of competing with boys. Guy’s imaginative take on superheroes soars above anything you’ve ever read before as The Divaz Five take on new superpowers and awesome athletic abilities. I had a grand time reading this book. Guy’s characters are introduced so well by Skylie, and they quickly became real for me. The plot is entertaining and exciting, filled with twists, turns and the totally unexpected. I’m looking forward to reading the next book in this series. Confessions of a Tween Superheroine: The Dunk'N Divaz Series, PlayBook 1 is most highly recommended.